Lady Jane Grey had the misfortune to be born with royal ties. She was the granddaughter of Henry VIII’s sister Mary, making her the king’s grandneice and a first cousin once removed of his son King Edward VI. On the strength of that tie, Jane’s parents and in-laws tried to make her queen of England, supplanting King Henry’s daughters (Edward’s half-sisters) Mary and Elizabeth. Jane’s father, Henry Grey, Duke of Suffolk, sided with the English church reformers, as did John Dudley, Duke of Northumberland. Scheming for power, Northumberland arranged to marry his son Guildford to Jane. When Edward’s health declined, Northumberland and Suffolk felt uneasy at the prospect of a Roman Catholic successor—Mary. They seem to have been motivated less with concern for the Reformation than for their own power and influence. They manipulated Edward’s religious sympathies to have him appoint Jane as his successor. Edward was willing: he liked Jane, with whom he had played as a child, and knew she was staunchly Protestant. When her ambitious family announced to Jane that she was to be queen, she wept uncontrollably, rejecting the idea. However, her parents and in-laws insisted. Later she would reproach her father that he, whose responsibility it was to seek to prolong her life, had helped bring it to an untimely end. Jane was proclaimed queen on July 10, 1553. Northumberland rode off to capture Mary but failed. The common people of England so detested him that they rallied behind the Catholic heir. And so, just nine days after ascending the throne, Jane became a prisoner in the Tower of London. She wrote Mary a repentant letter, but pointed out that she had been forced into her action, which was not of her own seeking. Mary was lenient. However, Jane’s father soon participated in another rebellion against Mary. It sealed his daughter’s doom. She was condemned to death. Mary’s chaplain, John Feckenham, persuaded the queen to delay Jane’s execution so that he would have a chance to convert her to Catholicism. But while Jane appreciated Feckenham’s kindness toward her, she clung to her religious views. She had been well-tutored, could read and write several languages fluently, and appreciated the positions of the reformers, some of whom she had met and corresponded with. On this day, February 12, 1554, Jane and her husband were executed. Guildford was beheaded publicly but, fearing to produce an angry mob, the authorities beheaded pretty, seventeen-year-old Jane inside the Tower. 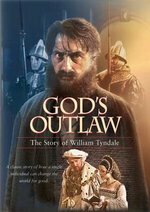 God’s Outlaw tells the story of William Tyndale, one of the early English reformers. Feckenham accompanied her to the place of execution. There Jane thanked him for his kindness, insisted once more that she had been innocent of any desire for the throne, recited Psalm 51 in English, and forgave her executioner, asking him not to strike the blow until her neck was on the block. After a blindfold was wrapped around her eyes, she groped for the block, crying out, “What shall I do? Where is it?” Someone guided her to the spot. Her last words were, “Lord, into thy hands I commend my spirit.” Then the executioner brought down the axe.